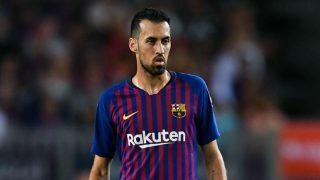 Barcelona midfielder Sergio Busquets won’t be taking Manchester United lightly when the two teams meet in the Champions League quarter-finals. The first leg takes place at Old Trafford but nobody is mentioning home advantage in our favour. Not that we expect to be favourites going into this game, but it’s telling that yet again people are giving United no chance, which was also the case before we knocked Paris Saint-Germain out of the competition. Barcelona are running away with the La Liga title this season and although they might not be as good as they were in previous years, this side with Lionel Messi could still go all the way in Europe and become champions again. Busquets admits United are now a better side under Ole Gunnar Solskjaer, a comment former manager José Mourinho won’t enjoy. The Barça midfielder believes United are at their strongest when they play on the break or on set-pieces. United face an almighty task but we’ve got to give ourselves a chance. Barcelona were knocked out of this stage of the Champions League last season against Roma, so why can’t the Reds do the same? It’s a pretty open competition this year and anything is possible.